This unique pendant strengthens one's Rahu, Mars and Jupiter. Hessonite Garnet, the gem for Rahu (the North Node of the Moon), reduces any compulsive actions or addictions, and promotes stability and security, ridding you of any unwarranted fears. Red Coral, the gem for Mars, increases your strength, energy, courage, independence, and bodily warmth. Citrine, the gem for Jupiter, gives happiness, optimism, increases wealth and spiritual tendencies. 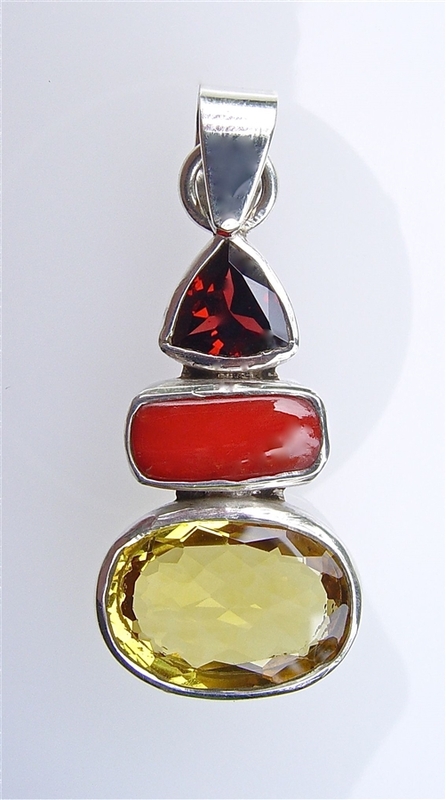 Hessonite Garnet, Red Coral, Citrine Pendant. The pendant is approximately 50mm high. The Hessonite Garnet is triangular and edge to edge is approximately 10mm. The Red Coral is approximately 13mm wide by 5mm high. The citrine is approximately 19mm wide by 14mm high.